Pope Francis on June 19, 2018, appointed as bishop of Meath, Ireland, the Rev. Thomas Deeniham, of the clergy of the diocese of Cork and Ross, currently diocesan secretary. The Rev. Thomas Deeniham was born in Blackpool, Cork, on June 20, 1967. He carried out his theological studies at the Saint Patrich College of Maynooth. He subsequently obtained a doctorate in education from the University of Hull, England, in 2003. He was ordained a priest for the diocese of Meath on June 1, 1991. After ordination, he served as deputy priest in Glanmire (1991-1994), Schull (1994-1995), Kealkill (1995-1999) and Bantry (2003-2006). From 2003 to 2006 he was diocesan counselor for religious education in middle schools. From 2006 until the present he has served as diocesan secretary and secretary for diocesan education, member of the diocesan presbyteral council, the diocesan committee for finance, and member of various committees of the Irish Catholic Bishops’ Conference. Archbishop Okolo, Bishop Smith, priests and people of the Parish of Mullingar and the Diocese of Meath. It is quite daunting to stand before you this morning! Two weeks ago today, the Nuncio made contact with me and when we met the day after, he told me of the Holy Father’s wish to appoint me to this Diocese. My initial reaction was one of fear and there have been sleepless nights since. There is an acute sense of being unworthy for the task, the enormity of the task and a deficit too in local knowledge – be it geography or personality. Dare I mention the difficulties that deciphering a Cork accent will cause in this historic diocese! I know that I have much to learn from you all in the months ahead. Be patient with me! In the midst of this turmoil, my own bishop, Bishop Buckley, reassured me by saying that Cork, Meath and Westmeath people always get along unless they meet on the football field! Unfortunately, we could be getting on for a while! I can claim some linkage to Meath! Most significantly I was ordained a deacon in 1990 by Bishop Smith and I have two classmates who are priests of the diocese – Father Padraig McMahon, the Cathedral Administrator, and Father Martin Halpin, the Parish Priest of Ballinabrackey. The Vicar General, Father Declan Hurley, was also a contemporary and, more importantly, has Cork roots! A time of a new bishop is a time of uncertainty. In my current Diocese, we are waiting for a new bishop too. But while a diocese and a bishop are important, the reality for the people that we serve is that the parish and the local parish clergy are what matter. In that sense, a bishop, I believe, must support and be with the priests of a Diocese. Our own image of Church and, for those of us who are ordained, the seed of our vocation, depended very much on the priests that we encountered. I was fortunate in that regard. I always had the view that the Diocese of Meath has a unified and a talented clergy and younger too than many other dioceses. That must be a blessing. In the weeks and months ahead, I look forward to meeting the priests of the Diocese and visiting the various parishes. Those parishes could not survive either without the work and expertise of the laity who live in them and give of their talents willingly and freely. I look forward to working with those people into the future and benefiting from their expertise, commitment, and talents in supporting the Diocese, particularly in the areas of education, finance, and safeguarding. I am conscious also that linked to Pastoral Ministry is joy! Pope Francis referred to this in Evangelii Gaudium (85) when he stated that one of the more serious temptations which stifle boldness and zeal is a ‘defeatism that can turn us into querulous and disillusioned pessimists, sourpusses’! May I ask you to pray with me that we will keep and value that sense of joy as we work together in continually building and sustaining a welcoming and compassionate Church. In terms of my own background, I was ordained in 1991 and worked in Glanmire, which was my first appointment. In 1994, I was appointed to Bantry where I worked in the local Vocational School for nine years until 2003. During that time, I also worked in the parishes of Schull, Kealkil, and Bantry. It was, in many ways, the best of times and I enjoyed that mix of school and parish. I still have a few weddings and baptisms to do from friendships made during that time and, unfortunately, have had to do a few funerals also. School ministry is important and our young people are a vital congregation. They represent a virtual parish that we must always be conscious of. Linked to that, of course, is the continual need to promote and encourage vocations. In that regard, I would like to congratulate the Vocations Team in this Diocese who have been particularly conscious of that and whose work is bearing fruit. Since then, I have been working as Diocesan Secretary and in a few other roles such as General Secretary of CPSMA and as Acting Executive Secretary of the Council for Education and the Commission for Catholic Education and Formation of the Irish Episcopal Conference. In those roles, I have liaised more than once with your own Vicar General, Father Declan Hurley, Father Brendan Ludlow and Mr. Sean Wright. Indeed, I spoke to the Diocesan Members of Boards of Management of Community Schools and Designated Community Colleges in this Diocese last year – another example of people giving freely of their time and talents for the good of their parish. I must record my appreciation and admiration for the pioneering work that has already been undertaken in relation to Sacramental preparation for children not attending Catholic Schools in the Diocese. In my work, I have referenced the success of Father Declan Hurley and the experience in Navan quite frequently. I particularly appreciate the presence of pupils and teachers from the local parish schools here with us this morning. Catholic schools are an important part of the ministry of the Church and we must support parents who wish to send their children to a Catholic school. As I mentioned above, when we talk about Catholic schools, we should not talk of them in the abstract but we should talk about our own local parish schools. Catholic schools are not a notion or an ideology but, rather, Catholic schools are the schools in our own parishes, that serve and are part of the local communities and that teach and welcome the local children. Our schools and, particularly, the teachers who work in them, deserve our thanks and support. I look forward to celebrating Catholic Schools Week with the schools of this Parish and Diocese next January when, throughout the country, Catholic Schools will be celebrating their work and contribution in their local communities. Before I finish, I would like to thank the Papal Nuncio, Archbishop Okolo, for his encouragement and support over the past two weeks and for his presence this morning. His reassurance, as the representative of Pope Francis, has been important and encouraging for me. Given the context and volume of his work for the forthcoming Papal visit to the World Meeting of Families in August, his time and patience are all the more appreciated. I would like to thank Bishop Smith for his genuine welcome, advice, and support during that period also. From our first phone call, the sincerity of his welcome was unquestioned and his support unfaltering. I am glad that he will be near at hand in the months ahead and I hope I can count on that sound advice and support continuing. Bishop Smith must also be thanked for his leadership of the Diocese over the past years. Even for those of us outside the diocese, there was a sense about him of a father figure and a bishop who was close to his priests. I hope the same will and can be said of me when my time comes. And while I know that Bishop Smith deserves a long and happy retirement, I also hope that he will be present, active and feel welcome in the Diocese and in Diocesan celebrations in the years ahead. I would like to thank my own Bishop, John Buckley, whom I have worked with as Diocesan Secretary since 2006. 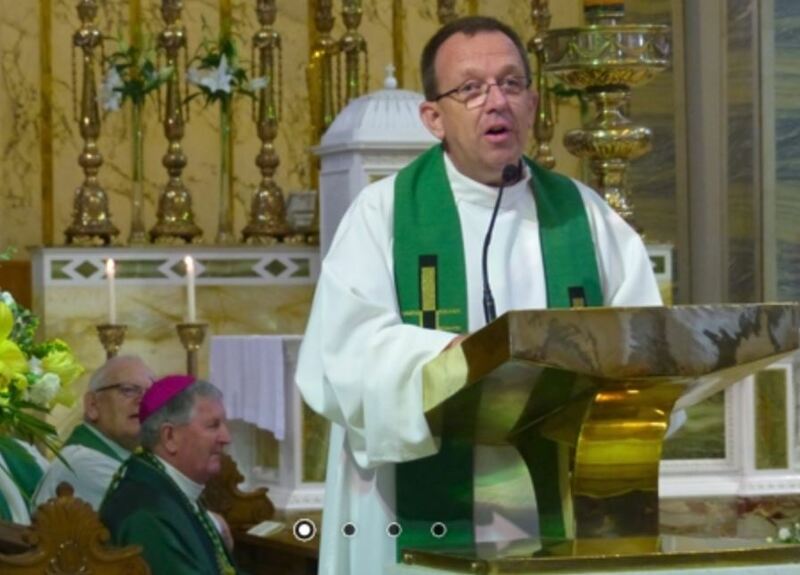 During that time, I have come to realize the importance of pastoral ministry in the life of the bishop and it is a lesson that I will bring to Meath. I look forward to meeting the people of the Diocese and, in particular, of Mullingar, the Cathedral parish. Without that pastoral and human contact, our ministry becomes empty. I hope that Bishop Buckley takes to visiting Mullingar when his own successor is appointed. My appreciation also to Father Paul Crosbie, the Diocesan Secretary, and Father Padraig McMahon, the Cathedral Administrator, for organizing this morning’s announcement. I appreciate very much their work, what they have organized this morning and their welcome. Finally, I would like to thank you for attending this morning. As I mentioned, I find it difficult to leave my family, friends and clerical colleagues, Cork and particularly West Cork, behind. In that context, the welcome and kind words that I have received are much appreciated as I prepare to move to my new home here in Mullingar. I received the news of my appointment on the Feast of Saint Boniface. The Second reading from the Office of Readings for that day, a letter by Saint Boniface, said many things to me in relation to my own apprehension and decision to accept the invitation of the Holy Father. Having said all that, Boniface finishes with a wish: ‘let us be careful shepherds’. I am conscious of the trust and responsibility placed on me and I pray that I will fulfill it. May God reward you. I ask you to remember me in your prayers and may we all seek to do God’s will in the months and years ahead.